After about 69,000 Model 8’s were produced, Remington felt the old workhorse needed a facelift and in 1936 introduced the Model 81…basically the same gun with a few minor cosmetic differences such as a heavier pistol-grip stock and more robust fore-end. As well, the gun was initially offered in a different range of calibers: .30, .32, (dropped after World War II) and .35 Remington. In 1940, .300 Savage was added to the lineup to make the 81 more competitive and give it “close to .30-06” performance. 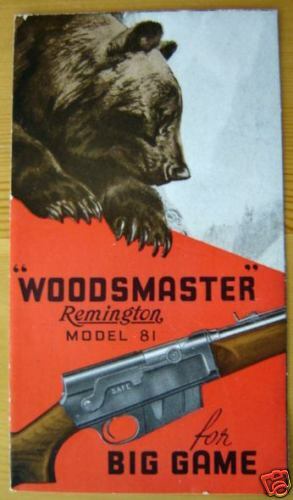 Named the Woodsmaster (a moniker that would also be given to Remington’s follow-on Model 740 and 740A autoloaders), like the Model 8 the 81 came in different grades: the 81A Standard with a plain stock and fore-end; 81B Special with checkered select wood; 81D Peerless sporting a bit of scroll engraving and fancier checkering; 81E Expert with more engraving yet and better checkering; and the top-of-the-line 81F Premier. Although they are a little different than the Model 8 on the outside they are very similar on the inside with many interchangeable parts. Even into the 21st century there are still thousands of Model 81’s still “springpolin”!